We try fairly hard to eat well around our house. Fruits and veggies are common snacks. We eat whole grains and lean meats. BUT morning is not my friend, and we usually end up eating cereal or “cereal bars” (which may have some redeeming qualities, but are mainly sugar and preservatives). And so I decided to look for an alternative, and I think I’ve found it: mini egg muffins. They take about 15 minutes from start to finish and only have a few ingredients! 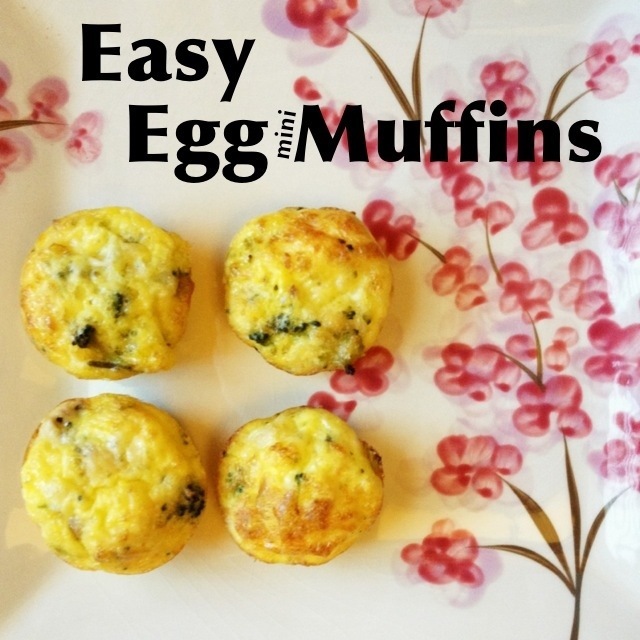 You can cook these in a regular size muffin tin, but it takes longer to cook…and to cool! Plus little hands can grasp at the little ones a lot better. Start by whisking 4 eggs in a small bowl. Add 1 cup of “goodies” and a little salt and pepper. What kind of “goodies?” Cheese, meats, veggies, whatever suits your fancy! Best part? You can mix and match your favorites, which for us is usually whatever was left over from dinner the night before. Just chop the meat and veggies into little pieces and toss them in! I’ve done ham with Swiss cheese, chicken and broccoli with Italian cheese, and pepperoni with mozzarella and parmesan. Remember that eggs expand when they cook, so only fill it about 2/3 full. It won’t look like much, but I promise it’ll rise. Bake at 350 degrees for about 10 minutes, or until golden brown. The toothpick test will work with these if you aren’t sure about doneness. Sounds wonderful! Thanks for the recipe! Do you use nonstick spray or butter your tins? I tried a similar recipe with paper cupcake liners and the muffins stuck so much that I haven’t tried it since.